Railpictures.ca - Doug Lawson Photo: DRGW 5401 lost in Williams Lake BC on the former BC Rail. Getting ready to head south on train 470. It was coupled to BCOL 4651, early morning sun and cramped area for photos did not help that day. | Railpictures.ca – Canadian Railway Photography – photographie ferroviaire Canadienne. 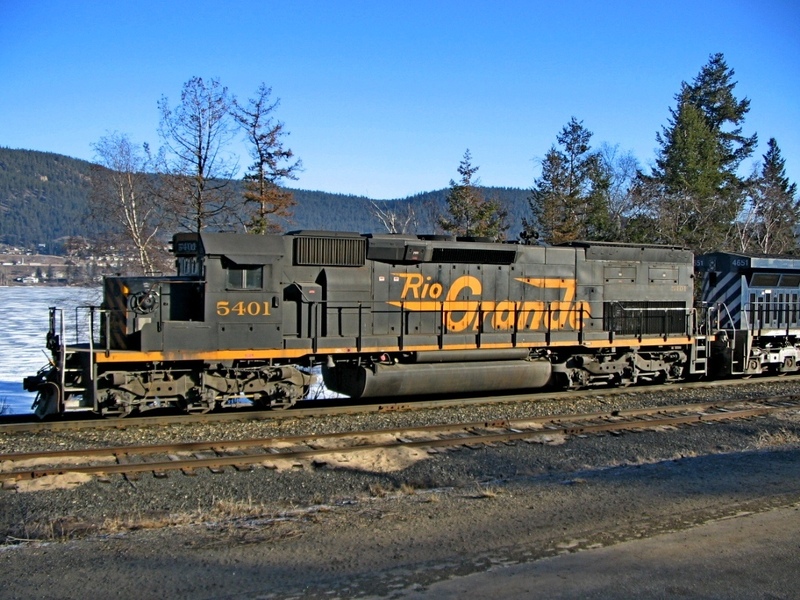 Caption: DRGW 5401 lost in Williams Lake BC on the former BC Rail. Getting ready to head south on train 470. It was coupled to BCOL 4651, early morning sun and cramped area for photos did not help that day. Best looking freight locomotive produced by EMD! Well, I knew it was not really lost, just a very odd unit to see on my home turf. Thanks for your explanation of it’s journey and the reason. I can just imagine who that person was in Motive Power that arranged this unit for pay back. Now if somebody could explain the odd odour in the cab !! Actually 5401 was not lost. It was provided to CN, under a specific request, to pay back HP Hours owing by UP. The request was by a person in Motive Power, just to see if this particular unit would be chosen – and it was ! It covered 38,000 miles pretty much coast to coast, between early Feb 2005 and June. It went as far east as Moncton NB and as far north, at least, as your image in Willys Puddle. Who knows maybe you can tell us that it went to Chetwynd ? ?